Posted on August 22, 2017 . Research conducted by the Biosciences eastern and central Africa-International Livestock Research Institute (BecA-ILRI) Hub in collaboration with National Health Laboratory of the Tanzania Ministry of Health and Social Welfare; Nelson Mandela African Institution of Science and Technology (NM-AIST); Sokoine University of Agriculture; Tanzania National Parks; Tanzania Wildlife Research Institute; Frankfurt Zoological Society; and Pennsylvania State University. 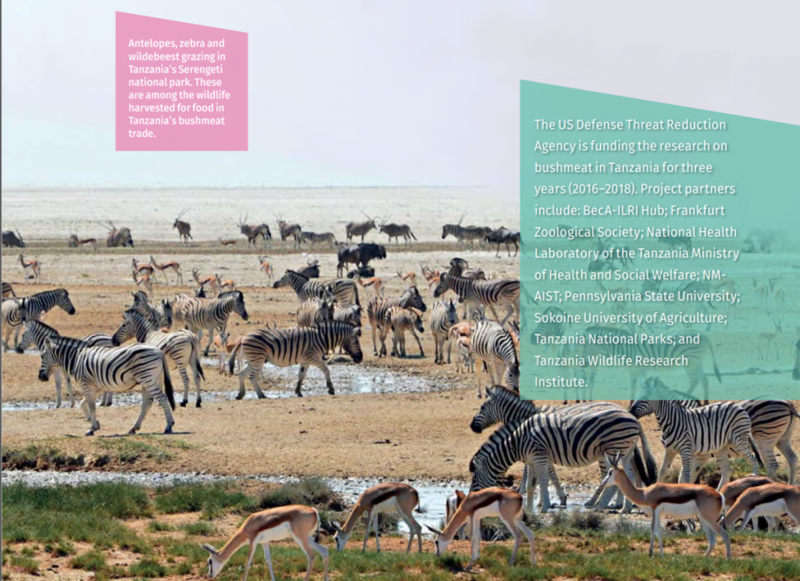 An outcome of the BecA-ILRI Hub’s Swedish funded initiative to strengthen infrastructural and human capability at NM-AIST, was the awarding of a grant to the institution by the US Defense Threat Reduction Agency. The NM-AIST School of Life Sciences and Bioengineering and a consortium of partners including the BecA-ILRI Hub received a grant to investigate the role of bushmeat in the transmission of six pathogens between animals and humans in Tanzania. An interdisciplinary and multi-institutional team of scientists from Tanzania, Kenya and the US are using state-of-the-art techniques to map the distribution of anthrax, ebola, marburg and monkeypox viruses as well as Brucella and Coxiella in bushmeat in Tanzania. The team assesses the biological risk and potential for impact on human health from these diseases. The BecA-ILRI Hub provides capacity building, expertise and technology for the microbiome component of the project using the genomics platform. During a week-long workshop facilitated by the BecA-ILRI Hub at NM-AIST, Francesca Stomeo provided training on the theory and practice of the genomics pipeline to be used in the project.